When Hardy presented the large arbor reel to the world in 1911 they haven't ceased their high-end quality and unrelenting performance and now anounces the new Ultralite CA DD freshwater beauty developed by the Hardy Team in Alnwick, England. 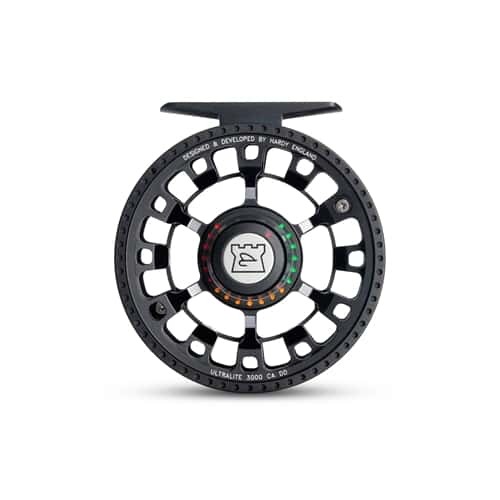 This top of the line large-arbor Ultralite CA DD fly reel by Hardy features aesthetic and structural improvements for fly fishermen everywhere. The new ultra large arbor Hardy Ultralite CA DD freshwater fly fishing reel has a stunning industrial design and a color coded drag system. With two toned anodosing, this Hardy Ultralite CA DD reel not only looks great, but functions as well as you would expect a Hardy reel to perform. MSRP $275.00 – $419.00 for this CA DD fly reel makes it a good price for an amazing reel that comes from barstock 6061 construction anodized aluminum for extra durability. This Ultralite CA DD reel has a lightweight feel with a large arbor which is very popular for fly reels out on the market today. This duo provides anglers with a lightweight reel that is perfect for the most technical freshwater species. Hardy's high-end quality and unrelenting performance now anounces the new Ultralite CA DD freshwater beauty developed by the Hardy Team in Alnwick, England. 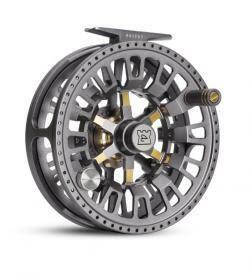 This top of the line large-arbor Ultralite CA DD fly reel by Hardy features aesthetic and structural improvements for fly fishermen everywhere. The CA DD body is made from barstock 6061 construction anodized aluminum for extra durability. With eight sizes available from size 3000 to 10000 and two color options, there is sure to be a reel fit for every angler's needs. Size 3000 for 3- to 5-weight lines is 3.54 inches and just 4.6 ounces. Hardy also introduces the color coded disc drag where the red dots on the drag knob indicate a stronger drag and the lighter drag settings are indicated by the green dots. In just one quick turn of the knob the drag can be changed from zero to maximum and you can easily see where that is via the colorful dots. Changing spools is just as easy as determing where the drag is set due to the captive spool release system which prevents the loss of any small parts when swapping spools. The two colors available are two-toned titanium or black. The black Hardy Ultralite CA DD comes in sizes 3000-7000 and MSRP is $275.00 – $309.00. The titanium CA DD reel comes in sizes 3000-10000 and priced at $275.00 – $419.00. All Hardy Ultralite CA DD reels come with a soft neoprene case. Extra matching spools are also available. Large arbor fly reels are very popular and sought after by beginners to expert fly fishermen worldwide due to the great line pick up they provide. This Hardy Ultralite CA DD Fly Reel is absolutely perfect for me. I really love how it looks too, so not only does this Hardy Ultralite CA DD Fly Reel fish great, but it also looks great too and came with amazing customer service. Great reel, good drag system and a great price! I received the order in a few days standard shipping which is pretty quick.